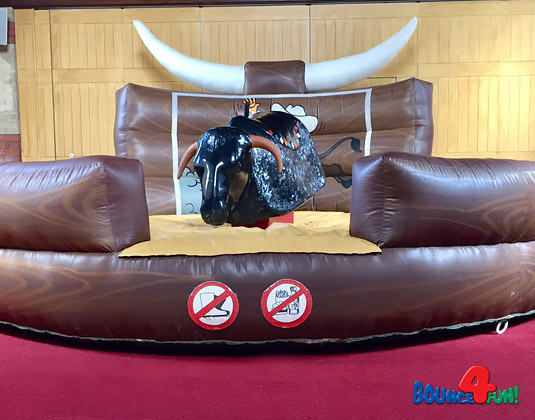 Bounce4Fun brings the Wild West to Basingstoke and Hampshire with it's Rodeo Bull. Release your inner cowboy/cowgirl and be prepared to be spun around and around and have your bucking bronco skills tested to the limit until eventually you fall off to the soft inflatable bed below! Fully trained operators will setup and supervise you for the entire duration of your hire to ensure all safety standards are met as your safety is paramount and make sure everyone has lots of fun and that your party or event is never forgotten. Our Rodeo Bull multiride is built by GS Engineering who are considered to be the best in the world. All our operators are fully trained in health & safety and will keep you and your guests safe at all time. Dont trust the British weather? No problem! We also offer an inflatable marquee which has been specially designed for our Rodeo Bull so the fun can continue come rain or shine! Can be used both indoor and outside as long as there is a flat, even surface available. click to check availability & book online!